And, of course, I want to do it with the people who've made this book possible: my family, friends, and most importantly, my lovely, wonderful readers. Without you, there's no point in writing :). Zeiihbuans tend to eat desserts on a limited basis, reserving treats for celebratory events or to avoid waste (such as apple pies to use up apples that are spoiling). Because of this preference, their baked goods tend to be less sweet than those made in Ærenden. Often recipes highlight fruit as a natural sweetener. In fruit-less treats, the Zeiihbuans use a fine powder made from the sycga plant, a dark green reed that typically grows four to five feet tall. 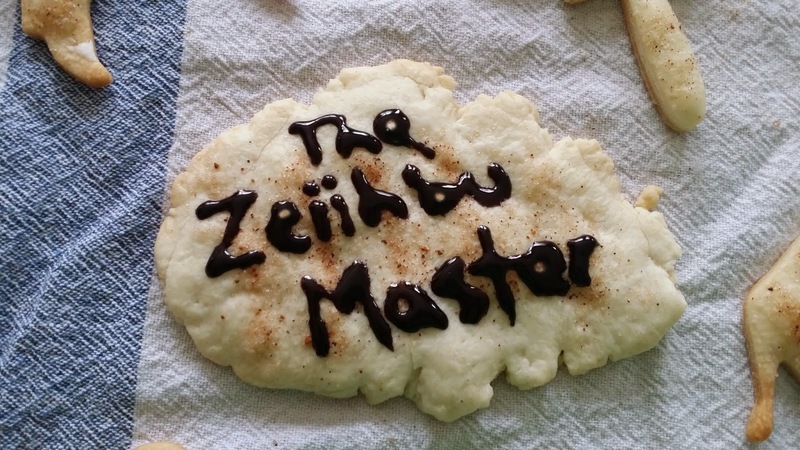 The most popular dessert in Zeiihbu is the Zeiihbu Celebratory Cookie. Cut into shapes representing tribal history, these cookies are served in sets of three (for luck) alongside knuckle nut dusted vanilla ice cream topped with raspberry syrup. Of course, we don't have the sycga plant on Earth, but sugar can serve as a suitable substitute. Likewise, nutmeg can replace knuckle nuts (named because they're about the same size as an adult knuckle). 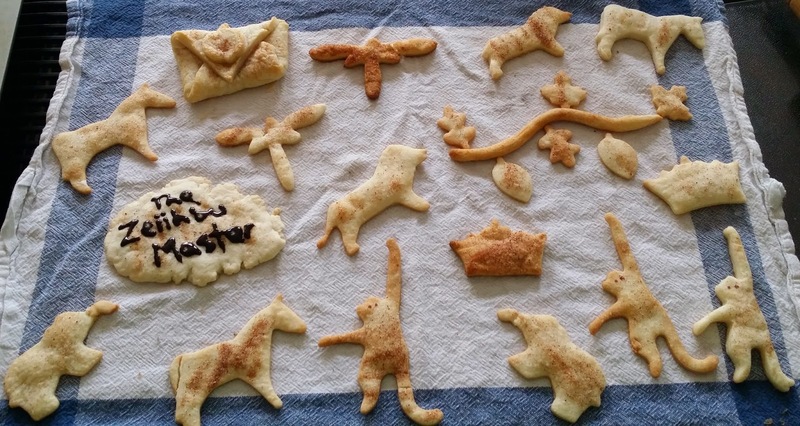 Since our celebration is not Zeiihbu heritage, but the launch of The Zeiihbu Master, I've changed the shapes of our cookies to represent what we're celebrating. Feel free to make the dessert at home. I've included the recipe for you below, translated for Earth cooking :). Crown, Moereth, and Dranx Monkey. 2. Mix sugar, cinnamon, and nutmeg. Set aside. 3. Prepare a standard 9-inch pie crust or use a refrigerated store crust. Roll onto a greased and lightly flowered cookie sheet (or use baking spray). 4. Cut shapes using standard cookie cutters and line up on the cookie sheet. 5. Sprinkle sugar mixture over cookies (to taste). I used about 1/3 of the mix for less sweet cookies. 6. Bake for 5-8 minutes, depending on thickness of crust. Monitor carefully! Both the sugar and dough burn quickly. 7. Serve with ice cream and fruit (or syrup) of your choice. Please join me in celebrating The Zeiihbu Master's release today on Facebook by following this link: https://www.facebook.com/events/1377612335846496/?context=create. And please, if you enjoy the Ærenden series, spread the word! This is so cool! Your world is so detailed!